A special board meeting was held to review progress on ATEP, including land configuration, phases of development, potential partners, architectural plans for IVC's first building, and Saddleback's future plans for the site. Information was provided about Tustin Legacy development efforts near the ATEP site. A California Environmental Quality Act (CEQA) public hearing was held to gather public input. Two agenda items were approved: 1.) Resolution No. 16-13 for the ATEP County of Orange Amended and Reinstated Exchange Agreement and Ground Lease, and CEQA Environmental Analysis Checklist for the County Animal Care Center; and 2.) Resolution No. 16-14 for the ATEP County of Orange Amended and Restated Exchange Agreement and Ground Lease. For more information about ATEP development, progress and plans, view the ATEP Status Report Presentation on Site Development. Johnathan Forde was sworn into office as the Student Trustee. He will serve a one-year term through April 2017. All consent calendar items, general action items, and academic and classified personnel actions except for 5.5 which was pulled. For additional information, please contact the Chancellor, College President or appropriate Vice Chancellor. Resolutions honoring: District Services Classified Employees of the Year Betty McClelland, Dan Johnson and Steven Gross; SC Classified Employee of the Year Michelle MacDougall Jackson; SC Professor of the Year Steve Teh; SC Part-Time Professor of the Year Jeffrey Oderlin; SC Emeritus Professor of the Year Lisa Messenger; and National Athletic Trainer of the Year Brad McReynolds. Curriculum revisions for the 2016-17 Academic Year for both colleges. Contract for $145,020.00 with Brilliant Energy Solutions for Deputy Sector Navigator Energy Efficiency and Utilities project direction and oversight, effective July 1, 2016 through June 30, 2017. Saddleback College Satellite Coffee Cart Services agreement with The Drip Coffee, for a one year extension from July 1, 2016 to June 30, 2017. Amendment No. 3 to the Saddleback College Cafeteria Operation and Food Vending Services agreement with S & B Foods for the second one-year extension beginning July 1, 2016 and ending June 30, 2017. Amendment No. 3 to the Educational Services Agreement with Academic Chess in the amount of $32,312 for a new contract total of $130,000. Contract with Neudesic LLC to support SIS-related software projects for this fiscal year, including upgrading MySite to version 3.0 which will include the Student Success Dashboard for an amount not to exceed $188,000 for the term of May 17, 2016 through August 31, 2016. 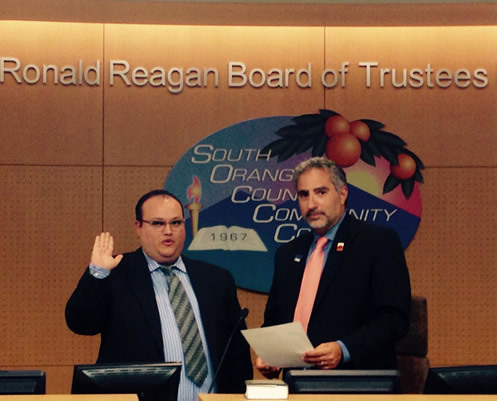 Resolution 16-16 to notify the Orange County Department of Education of the consolidated governing board election specifications for the 2016 board elections. Award of Bid for Irvine Valley College Barranca Entrance project for Hillcrest Contracting, Inc., in the amount of $1,465,770. Board Policy Revisions: BP- 2120 Institutional Planning, BP-3450 Traffic and Parking Regulations, BP-5618 Credit by Examination - Specific Course Credit, BP-5610.1 Student Fees. Rescind approval of sabbatical leave for Loma Hopkins for the Fall 2016 semester due to retirement. SOCCCD Equal Opportunity Plan which is designed to communicate the importance of diversity in the workplace and eliminate barriers to equal employment opportunities. CSEA Tentative Agreement for the term of July 1, 2015 to June 30, 2018. Trustee Prendergast attended an OCSBA meeting with a presentation on improving education. He also attended a St. Baldrick's fundraiser at SC where he shaved his head in support of children's cancer research. He attended the scholarship ceremony at SC and is looking forward to commencement. Trustee Jay attended nine events, including SC vet recognition, IVC foundation board meeting, IVC special services ceremony, SC nurses pinning ceremony and SC scholarship ceremony where a single mother was chosen to receive the Dr. Bill Jay scholarship. Trustee Jemal attended the SC nurses pinning ceremony which was excellent and the SC scholarship ceremony. He praised Dr. Tod Burnett and the SC foundation for their extraordinary efforts to raise more than $11 million. Trustee Wright attended the OCSBA meeting, the SC vets recognition ceremony where Loma Hopkins was also honored (retiring), an informative session on Cinco de Mayo at SC, and IVC's college recognition ceremony to honor faculty and staff for their excellence. He was especially impressed with the robotics team winner at the UCI robotics competition who developed a robot to assist EMTs. Trustee Lang thanked former Student Trustee Lemar Momand for his service and welcomed new student trustee Johnathan Forde. He called attention to those being recognized with resolutions in this month's agenda and thanked them for their excellence and dedication. He also called attention to faculty members at IVC who were recognized by students who have transferred to UCI. He is looking forward to commencement. Trustee Milchiker attended numerous events including the Lariat open house, One Book, One College at SC, SC student artist's award, OCSBA, IVC student debate presentation, IVC newly tenured faculty, Soka University as a guest speaker, Journalism banquet, nurses pinning, SC scholarship ceremony, ATEP tour, scholar baller event, and the OC Legislative Task Force meeting. Trustee Whitt attended a networking event at OCSBA and the nurses pinning ceremony. She commented on how unique and special they are each year and she has been to many, and the SC foundation retreat which was valuable. Student Trustee Forde attended the student government awards at IVC and the Psi Beta ceremony. He thanked his fellow students for their confidence in him as they elected him to represent students across the district. Chancellor Gary Poertner commented that we are in the rush towards the end of the academic year with commencement next week. He thanked all of the staff and faculty who are on the front lines working with students for their hard work, especially during this time of year, and wished a pleasant time off to faculty taking a summer break. Saddleback College - President Tod Burnett's written report included: the college is looking forward to commencement speaker and keynote speaker Frank Talarico, Jr., president and CEO of Goodwill of Orange County. The college’s Nursing Program honored 53 graduating nursing students in a symbolic candle lighting and pinning ceremony. Each graduate received a time-honored pin, a symbol of a nurse's service to others, and their induction into the nursing profession. The Saddleback College Foundation's scholarship ceremony was held and approximately $732,000 in scholarships was awarded to more than 400 students. The Saddleback College employee and student recognition awards ceremony will be held on May 18th and more than 70 individuals will be recognized, including professors of the year, innovation and leadership award winners, newly-tenured faculty, classified staff person of the year, student award winners, and many others. The Sodalis Piano Quartet performed to a full house in the McKinney Theatre. The Department of Theatre Arts' production of A Night of Chekhov directed by Olivia Trevino, was well received by audiences. The Saddleback College VETS Program hosted a VetNet Ally training to aid our staff, faculty, and administration in serving our student veterans. Irvine Valley College - President Glenn Roquemore’s written report included: the college was awarded a $1.5 million "Basic Skills and Student Outcomes Transformation" grant from the California Community Colleges Chancellor's Office. The goal is to transform basic skills coursework so that students are more readily able to complete gatekeeper transfer-level math and English courses in a shorter period of time, thereby increasing completion. The grant distributes the first $500,000 to the college beginning July 1. Funds are provided for three years and outcome tracking for the grant projects continues for five years through 2021. The Casa Del Sol documentary was featured as part of the Newport Beach Film Festival. The film highlights Team Orange County through their journey of designing and building Casa Del Sol for the Solar Decathlon competition. UCI will honor IVC professors at the Educator Recognition Reception. Each year, UCI asks their most academically successful students to name the instructor or counselor at their community college who had the most significant impact on their academic performance and successful transfer to UCI. The women’s sand volleyball team captured its second straight Orange Empire Conference title. The Forensics Team was awarded a first-place plaque at the Pacific Southwest Collegiate Forensics Association Ceremony. Vice Chancellor Debra Fitzsimons' oral report included: an overview of the Governor's May Revise including the impact to our district. The board meeting may be viewed online at www.socccd.edu. Television broadcasts are scheduled for 7 pm on Friday, May 20 and Saturday, May 21 on SC Channel 39 and IVC Channel 33. SC TV 39 has an additional broadcast on Sunday, May 22 at 7 pm.